The macro presented here is an excellent way to protect users from inadvertently closing their file before saving. When implemented, this macro ensures that Excel automatically saves the workbook before closing it. Excel will normally warn users who are attempting to close an unsaved workbook, giving them an option to save before closing. However, many users may blow past the warning and inadvertently click No, telling Excel to close without saving. With this macro, you are protecting against this by automatically saving before closing. The code is triggered by the workbook’s BeforeClose event. When you try to close the workbook, this event fires, running the code within. The crux of the code is simple — it asks the users whether they want to close the workbook. The macro then evaluates whether the user clicked OK or Cancel. The message you see when you try to close the workbook. In Step 1, you activate the message box as the condition check for the Select Case statement. You use vbOKCancel argument to ensure that the OK and Cancel buttons are presented as choices. In Step 2, if the user clicked Cancel in the message box, the macro tells Excel to cancel the Workbook_Close event by passing True to the Cancel Boolean. If the user clicked the OK button in the message box, Step 3 takes effect. Here, you tell Excel to save the workbook. 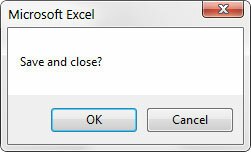 And because you didn’t set the Cancel Boolean to True, Excel continues with the close. In Step 4, you simply close out the Select Case statement. Every time you instantiate a Select Case, you must close it out with a corresponding End Select. In the Event drop-down list, select the BeforeClose event. Enter your code in the Workbook BeforeClose event.